In this study, methods, originally developed to assess life course trajectories, are explored in order to evaluate land change through the analysis of sequences of land use/cover. 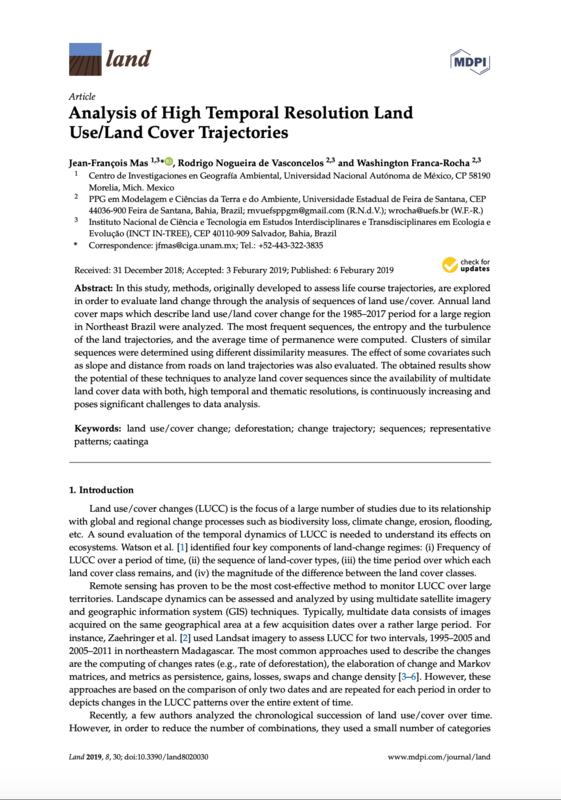 Annual land cover maps which describe land use/land cover change for the 1985–2017 period for a large region in Northeast Brazil were analyzed. The most frequent sequences, the entropy and the turbulence of the land trajectories, and the average time of permanence were computed. Clusters of similar sequences were determined using different dissimilarity measures. The effect of some covariates such as slope and distance from roads on land trajectories was also evaluated. The obtained results show the potential of these techniques to analyze land cover sequences since the availability of multidate land cover data with both, high temporal and thematic resolutions, is continuously increasing and poses significant challenges to data analysis. Jean-François Mas, Rodrigo Nogueira de Vasconcelos, and Washington Franca-Rocha. La Universidad Nacional Autónoma de México (UNAM) es una universidad pública mexicana. Es una de las mejores universidades del mundo dado su extenso trabajo académico.